PROVIDENCE — A group of downtown property owners has gone to court to halt a series of city and state projects designed to, among other things, improve bus service, including changing traffic patterns and making Washington Street open to buses only. Kathleen Gannon, vice chair of the Rhode Island Bicycle Coalition’s board of directors, said the Providence-based advocacy group is also alarmed by the lawsuit’s contention that “increased bicycle traffic” will be a negative byproduct of the plaza’s redesign. The plaintiffs claim that the Kennedy Plaza redesign could impact their quality of life and bring down property values. 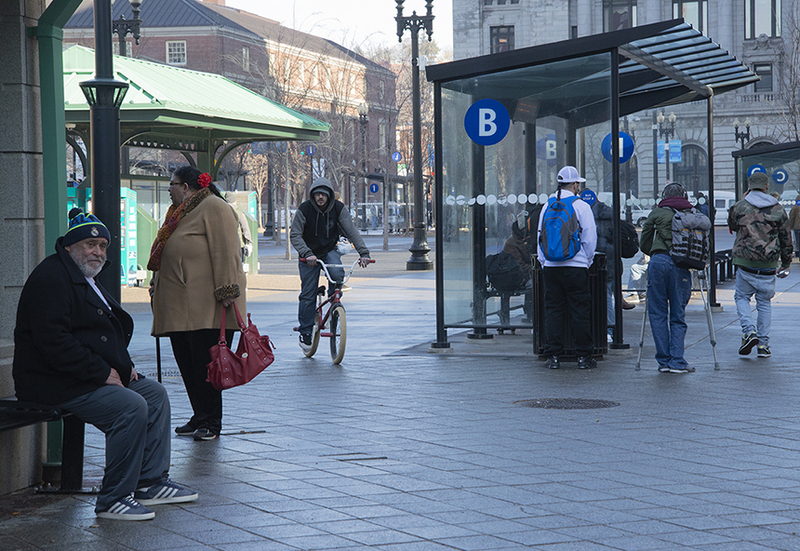 In the lawsuit filed in Superior Court last month, the plaintiffs, including entities controlled by former mayor Joseph Paolino, claim that a bus hub at the Providence train station and the dedicated bus corridor being built through Kennedy Plaza could impact their quality of life and bring down property values. “The Kennedy Plaza Project and specifically the re-routing of the bus routes, alteration of bus stops and alteration of traffic patterns on Fulton Street and Washington Street stands to cause property damage, property devaluation, inconvenience, annoyance and an interference with the Plaintiffs’ quiet enjoyment of their Properties,” according to the lawsuit filed by Concerned Citizens of Capital Center LLC, a recently created nonprofit that includes about a dozen commercial and residential owners and partnerships that own three downtown buildings — 100 Westminster Partners LLC, 30 Kennedy Partners LLC, and Exchange Street Hotel LLC. The suit names the city of Providence, the Rhode Island Department of Transportation, and the Rhode Island Public Transit Authority, among others, as defendants. Joe Mancini, who is representing the Concerned Citizens of Capital Center, told ABC 6 News last month that his clients will lose access to parking and garage spaces and that the changes don’t address current issues and concerns in Kennedy Plaza. Gannon said the redesign’s overarching intent — a truly intermodal transportation hub in the center of Providence — is promising. She noted that an emphasis on cars to the near exclusion of other transportation options hasn’t served downtown Providence well. In fact, she believes the car-orientated downtown design has led to a loss of retail activity and jobs and lower property values. “Instead of trying to work cooperatively with the people who actually rely on the bus system and with other stakeholders, developer Joseph Paolino and his allies have opted to go to court to stop state and local plans to improve bus service in the center of Providence,” according to Barry Schiller, a RIPTA Riders Alliance member. “Those bringing this lawsuit fail to recognize that public transit — and bicycle ridership — is essential in combating the pollution and traffic congestion that contribute to climate change,” according to the RIPTA Riders Alliance.